People still debate whether social media and twitter in particular is a useful business tool for purchasing and finance people. There is still the perception that twitter is all about celebrities and politicians using it as a vehicle for self publicity. Well it is that but it’s much more too and as more and more people embrace twitter in their professional lives, it can be difficult to know who is best to follow and why. Now, if you are still skeptical, there’s a great paper that will help you out. With Frank’s kind permission, we’ve taken that chart and enhanced it slightly. You can down load the PDF file here or click on the image. 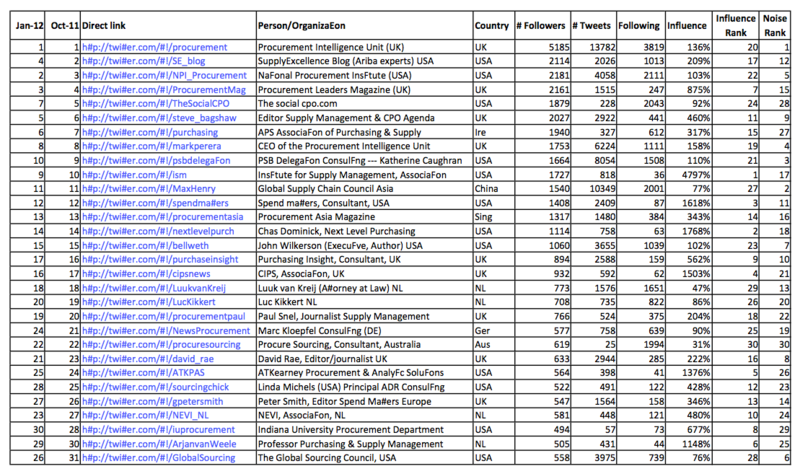 The chart shows the most important tweeps (tweeters) in the purchasing and supply chain space. It’s ranked by number of followers but we’ve enhanced the original chart a little to show influence too. On the face of it, your influence on twitter is indicated by the number of followers you have, however, a more meaningful indicator of true influence is the ratio of followers to follows. A tweep who has many followers despite following few clearly has things to say that others want to hear. It’s not a perfect measure of course. As Peter Smith pointed out via twitter, “corporate” tweeters may not tend to follow many but it does put into context the large followings that some tweeters have who also follow many. It’s worth taking a look to see who your not following and while you’re at it, click the twitter button below and spread the word.